There's one thing all dermatologists will agree on: Retinol is the gold-standard ingredient in skin care. Retinoids, which are different-strength derivatives of vitamin A, have the ability to exfoliate the top layer of skin cells at lightning speed, subsequently encouraging collagen production, ironing away fine lines and wrinkles, minimizing hyperpigmentation, and keeping acne at bay. Retinoids may come highly recommended by the pros, but there are a number of important rules skin experts want you to remember when incorporating the wonder ingredient into your skin-care routine for the very first time — and it really pays to stick to them. We asked dermatologist Emma Wedgeworth to share her top five tips for nailing retinol in skin care... because no one wants to have to deal with sore, flaky skin when clear, healthy skin is your goal. "When I prescribe clinical-strength retinol, skin purging happens all the time," says Dr. Wedgeworth. "I really have to warn people, but I always tell my clients that they’ll get there — it’s just all this congestion coming out." That means breakouts — and it could mean a lot of them. As Dr. Wedgeworth explains, vitamin A is great at dissolving comedones, the blocked pores clogged with buildup from oil and keratin that can take form as either "closed" flesh-colored bumps or "open" blackheads, whiteheads, and small red bumps. "Once that whole process is happening, skin becomes more inflamed and red because the skin recognizes that something is changing, and so makes those little bumps into bigger, redder ones," Dr. Wedgeworth says — so if you hadn't noticed your blocked pores under the skin before, you're about to notice them tenfold. "For some people it can be really active, but it settles after that stage, so I always warn people that when it comes to acne, things get worse before they get better," she says. "[Skin purging] is less likely to happen with a milder form of retinol," Dr Wedgeworth says. As far as over-the-counter options, Shani Darden's Texture Reform is a great place to start: The gentle nightly serum is packed with aloe, niacinamide, and coffee-fruit extract in addition to a mild retinoid for serious soothing and resurfacing properties (which is exactly why it's one of our 2018 Beauty Innovator Awards winners). 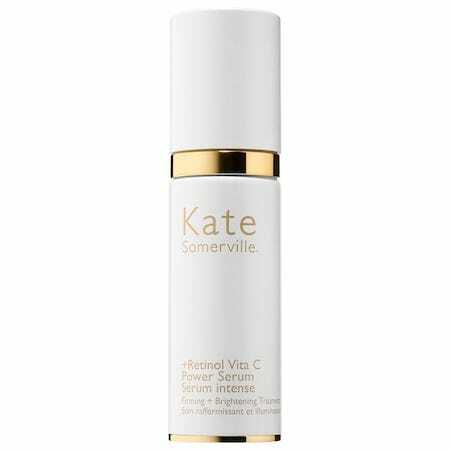 For a more affordable alternative, there's Neutrogena Rapid Wrinkle Repair serum, which comes highly recommended by derms; Kate Somerville's new +Retinol Vita C Power Serum is also earning rave reviews. Regardless of how badly you purge, that phase shouldn't last long. "The timeframe is different for everyone, and it depends on the sort of skin you’ve got and how many blocked pores you have," Dr. Wedgeworth says. "The first four to six weeks of using a retinol can be worse, but it tends to settle down soon after that." "It really pays to build up your retinol use," Dr. Wedgeworth says. "Listen to your skin and combine retinol with other products." She recommends that sensitive skin types start by using it just twice a week, mixing a couple of drops into your favorite moisturizer after cleansing. "If you’re okay after two weeks, increase it to every other day, and if you aren’t sensitive, you can use it every other day," she says. "You can even put it neat onto the skin and apply moisturizer afterwards." Dr. Wedgeworth recommends approaching your skin-care cocktails with caution if you're a retinol novice. "I would ease back on the other actives you’re using, such as AHAs and BHAs (exfoliating acids). This way, most people tolerate retinol fine," she says. "It’s a fine line, though. A little bit of flakiness and redness suggests it’s working, but you don’t want to push the skin too much." One thing you should always use in the day is sunscreen, as retinol can increase your skin's sensitivity to UV light. "This is always the first area people notice changes," Dr. Wedgeworth explains — and that includes redness and flaky, sore skin. "Really gentle retinol can actually be very helpful for this area, but at first, avoid the eye and lip area and gradually build it up," she says. "Always apply something around your lips and eyes first to act as a protective barrier. I love Clinique's Pep-Start Pout Perfecting Balm."